Please Note: This Time Clock requires a monthly subscription for use, please see the subscription plans below. 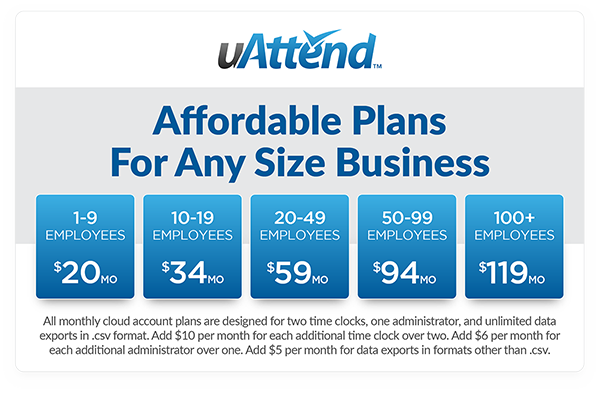 You will sign up for your plan after receiving the time clock. Employers can email time cards to employees. Any time clock that works with Quickbooks will function basically the same way. Quickbooks itself does not actually talk to any time clocks, which means we need to have a piece of software in between to act as the middleman. In this case it would be uAttend Software. 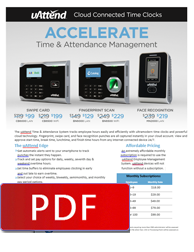 The employees punch at the time clock and those punches flow back to uAttend into each employees virtual time card. The administrators will login to uAttend and review the employees time cards for errors & missing punches, and add in any non work time, such as Sick, Vacation, Holiday, and more. Once the administrator is satisfied with each employees time card and it is time to process payroll, they will click an Export Data button that creates a file in the format Quickbooks is looking for. 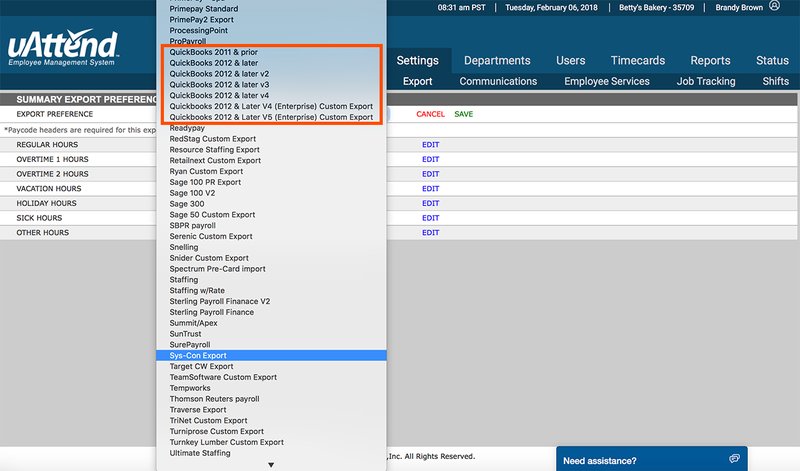 Each type of hours and the number of hours the employee had in that period will automatically be placed into their paycheck in the Quickbooks Payroll module. No more adding up time sheets, rounding time manually, or entering time by hand. uAttend will do all of that for you. Required subscription to the cloud allows you to access all punch data 24/7. Rules and policies created in the cloud seamlessly integrate onto the time clock. Add and edit positions and permissions with ease. Transfer employees among departments, locations, and track jobs. Pay periods: Weekly, Bi-Weekly, Semi-Monthly, and Monthly. Manage shifts, punch rounding, overtime, lockouts, accruals, vacation, holiday hours, and much more. Run real time reports on missed punches, employee hours, time card reports and much more. Create optional IP and geolocation restrictions for web and smartphone punching. Employees can view their cumulative hours and send time off requests from the time clock and in the cloud. Your subscription includes unlimited access to customer and technical support by phone, email, or live chat. Pretty cool system that actually scans employees faces. The enrollment process took a little getting used to, rotating their head and making sure it knows all the angles, but after that it's probably faster then our old badge clock. Employee steps in front and is pretty much instantly punched in. Seems very high tech to me!